Photo taken by Melody McKiver, Odawa, Algonquin territory. 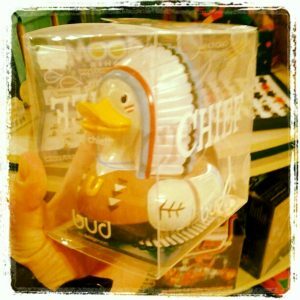 Rubber toy ducks with headdresses, ‘Drink like an Indian’ holiday poster, Sassy Squaw costumes, Dirty Drunken Half-Breed burgers, Matt Laur’s ‘Indian Giver’ comment to the much appropriated Navajo culture and design. It becomes apparent that mainstream media -and mainstream society – has a problem representing ‘Indians’. Hardly news for those of us who pay attention to mass media and its (dis)placement of Indians therein. When misrepresentation is offensive, it’s easy to become unreceptive to the many good things taking place in society to do with Indigenous peoples and the media. Indigenous Gerber baby models, Aboriginal key terminology guides for newsrooms, Ojibwe boxer/model for Cover Girl, to full-on art exhibitions dedicated to the exploration of Indigenous identity and culture. Through Scoop.it! an online curation tool, ‘(MIS) representation of Indigenous Peoples in Canada and beyond‘ is a collection of the good, the bad and everything in-between when it comes to mainstream media and the “Indian”. Here are some of the most recent scoops made up of photos, videos, news articles, reports and case studies.